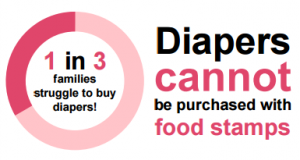 1 in 3 families don’t have all of the diapers they need to keep their infants clean, dry and healthy. Nurses see health complications of the serious rashes and infection created by leaving wet or soiled diapers on for too long, or by drying out and reusing diapers. The Healthy Mom&Baby Diaper Drive is nurses in hospitals and health facilities throughout the U.S. collecting diapers to give to their most vulnerable patients. 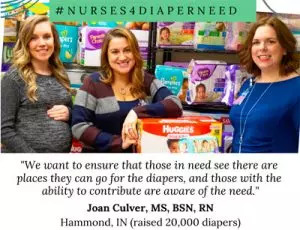 Working in partnership with diaper maker Huggies (TM) and the non-profit National Diaper Bank Network, since 2015, AWHONN nurses have shared approximately 1 million diapers with families in need right in their own communities. 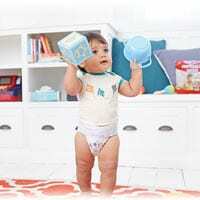 If you have donated diapers to a diaper bank please let us know by filling in the below form.